Batch billing can be run daily, monthly, or per your practice preference. In the Manage Module, click Billing. By default, patients only receive a bill if they have not been billed in the last 30 days. To generate a single statement, invoice, or receipt, see Statements instead. These options determine which statements show when generating the Billing List. We recommend you save default options so they are the same each time you generate the list. If using Clinics, default filter options can also be saved for each clinic. Note: If the Billing List opens instead, a list has already been created and there are unsent bills. Before you can generate a new list, you must send the unsent bills or delete them. To delete, click Close, then click Yes to the delete message. You will receive a notification when the deletion is successful. Click OK and the window will close. Click Billing to start again. Open Dental's blog post: FAQs Answered: Monthly Patient Billing. Setup: Set defaults and billing list filter options. Manage Module Preferences: Default statement and billing options. Billing Defaults: Set the general message, date range defaults, and electronic billing credentials (if sending eStatements). Electronic Billing: Regular email is not a secure method of sending statements (PHI). Run Billing/Finance Charges (once a month). Filter options show on the left of the window. Note: To save default filter options by clinic, select the clinic first, select the options, then click Save As Default. Include anyone not billed since: Include statements for families who have not been billed since this date. It defaults to one month prior and usually does not need to be changed. 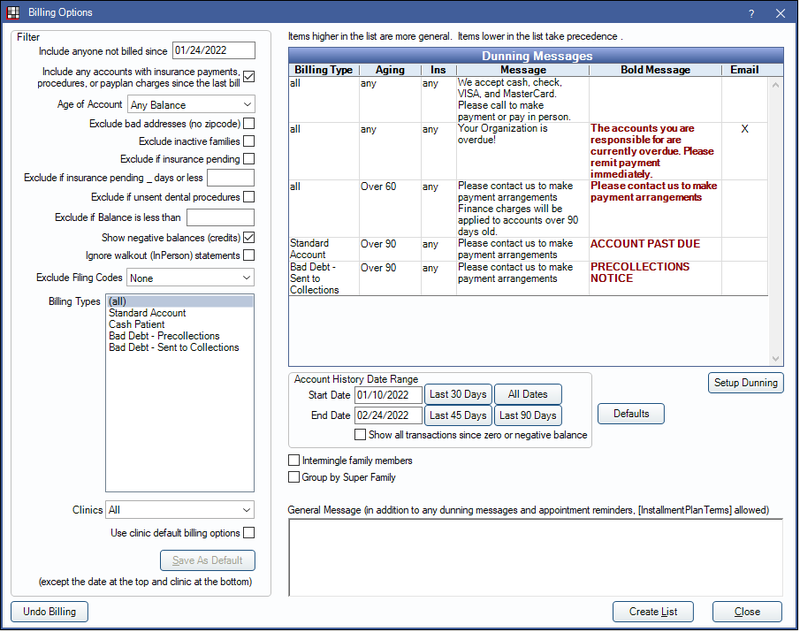 Include any accounts with insurance payments, procedures, or payplan charges since the last bill: Include statements for families who may have received a bill in the last 30 days, but have since had an insurance payment come in, had procedures completed, or has payment plan charges due or charges that will be due within the number of days set in Manage Module Preferences, Days in advance to bill payment plan amounts due. Age of Account: Only generate statements for families who have account balances in a specific Aging category (Any Balance, over 30 days, over 60 days, over 90 days). Exclude bad addresses (no zipcode): Do not create statements for guarantors with no zip code. Exclude inactive families: Do not create statements for families who have one or more family members with a status of inactive. The intent is to allow you to track outstanding balances for inactive families without sending a bill for the balance. Note: If other family members are continuing to receive treatment and you check this box, no statement will be generated for them. Exclude if insurance pending: Do not create statements for families who have one or more family members with an outstanding claim (any status other than received). Exclude if unsent procedures: Do not create statements for families with one or more family members who have unsent procedures dated in the last 6 months. The purpose of this option is to prevent sending a statement before a claim is created (e.g. in larger organizations where billing is done in a separate department). Exclude if balance is less than: Do not generate statements for families that have a balance less than a set amount. Negative numbers are allowed. Show negative balances (credits): Create statements for families with a negative balance (they have paid more than they owe). If checked, these patients will be included even if you have entered a negative balance value for Exclude if balance is less than. If unchecked, patients with negative balances will not be forcefully excluded. Rather, the Exclude if balance is less than value will be considered. To include all families, regardless of balance (positive, negative, 0 balances): Exclude if balance is less than = 0, check Show negative balances. To only include families with balances of 0 or more: Exclude if balance is less than = 0, uncheck Show negative balances. To only include families with a positive or negative balance, but not 0 balances: Exclude if balance is less than = .01, check Show negative balances. To exclude families with balances less than $1: Exclude if balance is less than = 1, uncheck Show negative balances. Ignore Walkout (In Person) statements: If checked, families who were given a walkout statement will be included in the billing list. Billing Types: Select the billing types to include. Click and drag, or press Ctrl while clicking to select multiple types. Customize options in Definitions: Billing Types. Clinic: This clinic selection determines which clinic's default filter options show and. It can also be used to filter the billing list. Users can only select clinics they have access to. To set filter options for a specific clinic, select the clinic before selecting any filter options. Click the drop down to switch clinics or select All to select all clinics. Use clinic default billing options: Only shows when All is the selected clinic. Useful when each clinic has different filter defaults, yet you want to run the billing list for all clinics at once. Checking this option will generate each clinic's statements using its filter defaults. Save As Default: Save the selected settings as the default filter options. If a clinic is selected, the filter options will be saved for the selected clinic. The default settings for the options below are determined by Billing Defaults. Account History Date Range: The number of days of account history that will show on each statement. Only show transactions since last zero balance: If checked, all transactions since the last date the account balance was zero will print on the statement. The default Account History Date Range will be ignored. Intermingle Family Members: When checked, family members will be mixed together on the statement and ordered by date. When unchecked, each family member will have their own section on the statement with a total. Electronic billing is always intermingled. Group by Super Family: Only an option if Super Family is enabled. Check the box to create super statements instead of statements for each super family guarantor. A super statement will be addressed to the head of the super family and include account activity for all super family members, grouped by guarantor. Send text messages for these modes: Opt to send an additional text message about a statement when it is sent from the billing list. Only statements with modes that match selected modes will receive a text message, as long as the patient is eligible to receive text messages. The message can include a clickable URL that launches the Patient Portal where patients can view an online version of statements and/or make a payment. Set the text message and default mode selections in Billing Defaults. Only an option when Integrated Texting Feature in enabled. See Online Payment Management. General Message: Shows at the bottom of the statement in addition to dunning messages and appointment information. Undo Billing: See Billing List, Unsending Bills. The following reports may be useful for Billing to catch anything you have missed. Determine which patients need their billing type changed to pre-collections or collections, then follow-up as needed. Remember, the Aging calculations are based on the entire account balance not just the patient portion. Finance Charge Report: See which accounts had Billing/Finance Charges posted. Payment Plans Report: A list of patients on a payment plan that have amounts due within the next 10 days.